We continue exploring Rosario Head at Deception Pass State Park. 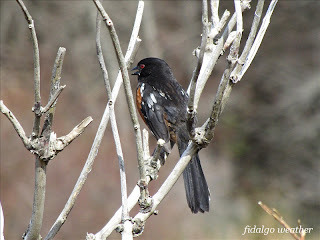 In the last post, we arrived at Rosario Beach via the Rosario-Bowman Bay Nature Trail. Beyond the Samish story pole are two trails that lead to the top of Rosario Head. There is a sign on the left trail warning of danger. This is puzzling to me since there is actually less danger here than we have already encountered. Perhaps there was an accident and the sign was put up in response. From high above the water there are stunning views of Whidbey Island, the Olympic Mountains and the San Juan Islands. Best come in early morning to photograph the mountains. Exposed volcanic rocks dot the waterways all around this viewpoint. In the photo, these will be nesting sites for seabirds and are off-limits to visitors. On the horizon are the San Juan Islands. The trees up here reveal the stresses on this exposed headland. It is built of solid stone with very little soil on top. The iconic Douglas Fir on the left has been shaped by the prevailing winds off the Strait of Juan de Fuca. Up close, it appears to have suffered even more in the hard winter just passed. On the right, the huge Madrona didn't make it. It appears to have lived for a time after toppling decades ago. In the end, it didn't survive. Madrona wood is like cast iron, so it will probably last many years more. Notice the entangled root of the nearby fir that was also pulled up. Zooming out into Rosario Strait reveals an oil tanker with a companion. Once inside the Strait of Juan de Fuca, these tankers must relinquish control to local pilot boats. They are not permitted to sail the inland waterways on their own. The tanker is probably heading to one of the refineries on March's Point in Anacortes. As we descend the left trail, we catch glimpses of Bowman Bay. Click on the image to enlarge it and notice the chain of rocky islets out in the bay. A tombolo or sand bar connects Rosario Head to Fidalgo Island. On the left, the outer side is littered with storm-tossed driftwood. On the inner side, Sharpe Cove is more protected. Across Sharpe Cove, a Douglas Fir growing in stone and thin soil becomes a natural bonsai. 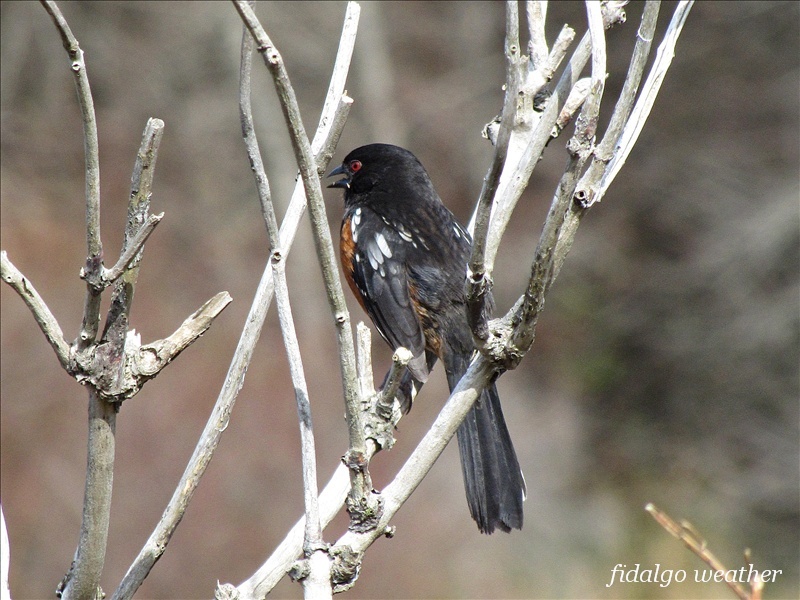 Near the beach, this Spotted Towhee (Pipilo maculatus) was singing his heart out. His enthusiasm was unmistakable, but nobody was answering. He was not in the least dispirited by that. Back on the trail, we catch a glimpse of our return destination, the Bowman Bay parking lot. The exposed rocks in the bay serve as resting sites for gregarious Double-crested Cormorants. They appear to enjoy these social get-togethers where they can preen and dry their feathers after diving. The base of this old Madrona bears evidence of great stresses inflicted on the tree over many years. The top of the same tree arches over the trail. Some limbs have died, but others hang onto life. Nearby, a new crop of seedling Madronas insures the future of the species here. Fine-pelted moss reveals cracks in this stone where a little moisture can accumulate. Lichens populate the more arid territories. Mosses are as difficult to identify from pictures as Lichens. This composition of stone, moss, lichens, fir needles and shadows reminds me of a Japanese screen painting. We end this hike where we began, back at the Bowman Bay picnic grounds. Nearby stands a statue commemorating the Civilian Conservation Corps workers who built the park. It was erected by a local chapter of CCC alumni. These men are very proud of the work they did here. That pride is well deserved. This is statue number 28, one of several erected in parks and conservation projects around the country to preserve the legacy of the CCC's. Skywatch Friday: Remember the Sky?